For all those who are forever seeking a little bit more. 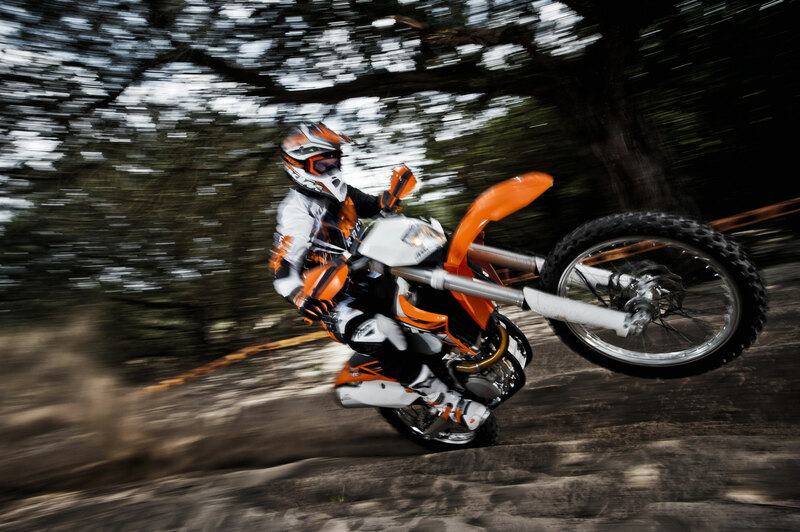 Perfectly controllable power in extravagant proportions, low weight and an unsurpassed chassis characterize an enduro of remarkable versatility: a sensational fighting machine and absolutely reliable workhorse rolled into one, the indisputable benchmark for street-legal enduro bikes in terms of weight and rideability – the KTM 500 EXC. One of the main aims was to develop bodywork with ultra-slim ergonomics and excellent contact points between rider and machine. It provides unlimited freedom of movement. Newly styled graphics give the new models a fresher appearance. In keeping with KTM tradition, the frames are made from high-quality, lightweight, chromoly steel profiles. In conjunction with the rear PDS damping system, they are designed for optimum absorption of shocks introduced into the frame by the rear wheel. In response to the trend for aluminum frames followed by our rivals, we supply a high-tech steel frame that weighs approx. 0.5 kg (1.1 lb.) less than the lightest competitor. Moreover, it’s easier to maintain, simpler to work on and it provides more space for the fuel tank and other components. 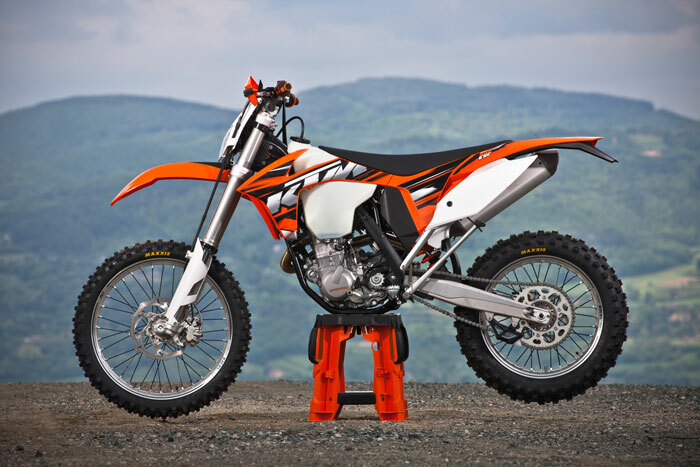 All KTM EXC models are fitted with the latest generation of fully adjustable 48 mm (1.89 in) open-cartridge forks “Made in Austria” by WP Suspension. Each model is individually tuned and the new fork oil provides improved responsiveness with more constant damping characteristics. 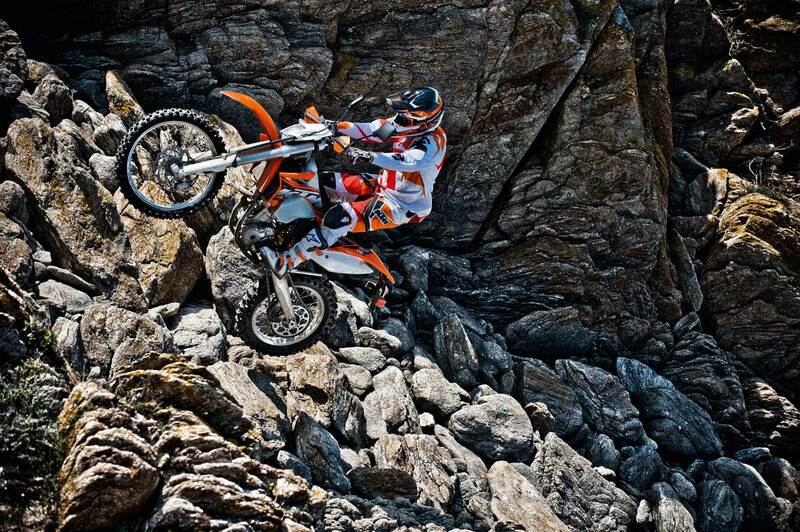 The high-quality KTM wheels with CNC-machined hubs are standard on KTM bikes. They are equipped with new, extremely stable, 7050 aluminum rims from GIANT and the spokes are now furnished with a premium black coating, representing an improvement in terms of corrosion resistance. New MAXXIS dual-sport tires – provide excellent traction, very precise directional control and a long service life. 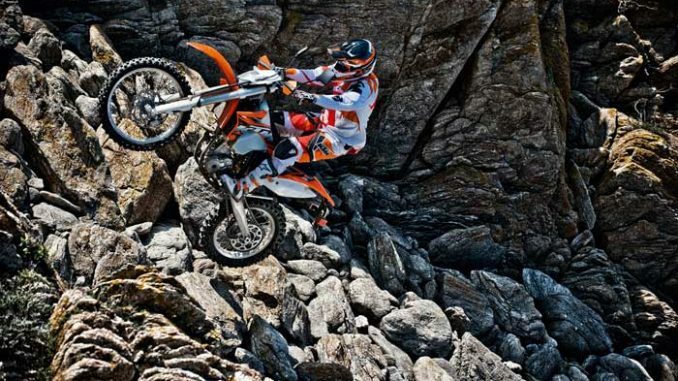 Brakes from Brembo® are standard equipment on KTM offroad bikes and, together with lightweight wave-type brake discs, they are recognized as the measure of all things in terms of application and brake performance. The further refined rear brake cylinder has a new internal mechanism that ensures less wear at the rubber seal for greater durability. The one-piece outer clutch hub with primary gear is machined from a single piece of high-strength steel. Unbeatable reliability is the result. It also allows the use of thin steel discs. This results in an extremely compact construction for a narrow engine width. A diaphragm spring enables the implementation of an additional hub damping mechanism – an invaluable benefit in terms of traction and gearbox durability. In conjunction with the diaphragm spring, the hydraulic clutch actuation system from Brembo ensures very smooth and very precise clutch control. 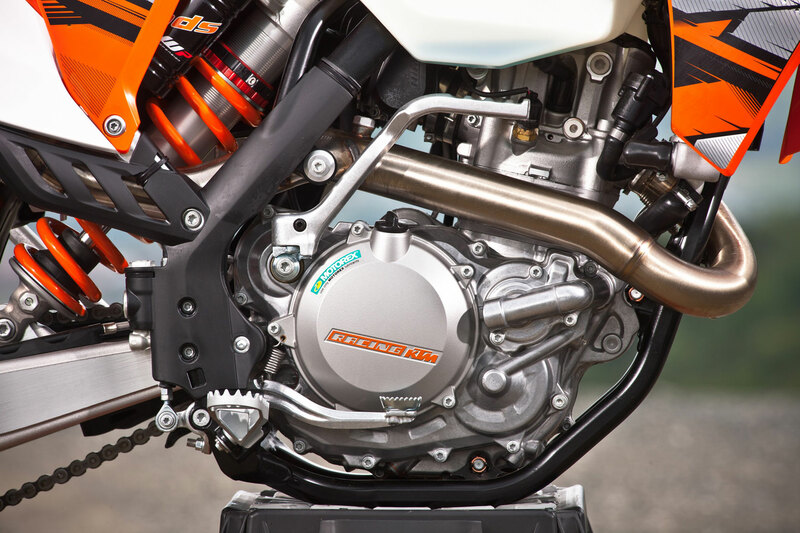 The SOHC cylinder head is equipped with an overhead camshaft that actuates the titanium intake valves and steel exhaust valves. 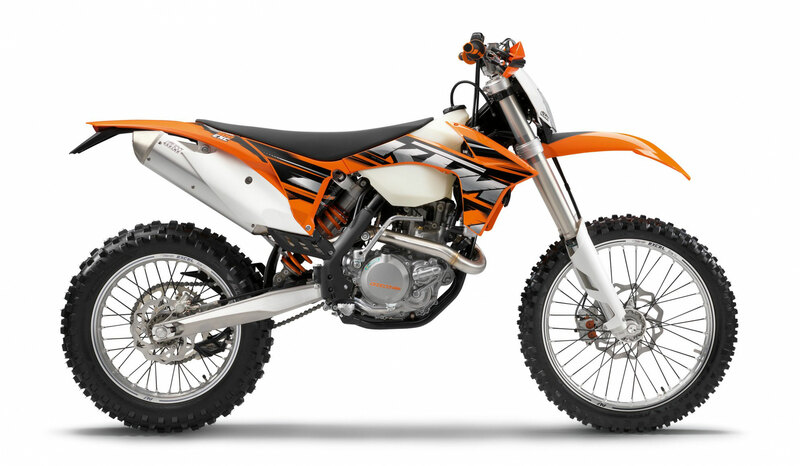 The whole configuration has been perfectly tuned to the Keihin EFI system for outstanding rideability and performance of the 2013 KTM 500 EXC. Through ingenious design work, KTM engineers succeeded in developing a small laterally positioned balancer shaft that also acts as a drive for the water pump. US MSRP Price: See dealer for pricing.